October 01, 2012 was a very special day for the railfan in me – I got the opportunity to visit Rameshwaram – this meant crossing the Pamban bridge by train and even take some photos of a train passing the bridge later on. But sleepless nights and intense heat coupled with high humidity took a toll on me – I was dead tired by afternoon, and we had no option but to beat retreat. After lunch (which I barely managed to eat – was too exhausted even for that), we (I was accompanied by Jayasankar on the trip) headed to the bus station (we took a town bus). We were heading back to Madurai – there was a TATA bus standing ready, but both of us wanted a Leyland. The next bus in queue was a Leyland. We decided to take this one. We headed towards the bus – TN-63N-1546 from Thirupattur depot of TNSTC-Karaikudi. We took seat in the front of the bus – the driver came around and suggested that we could take a seat at the back, which would be more comfortable. I confirmed that the seats at the front were not reserved for ladies and we decided to stick to the same seat. The conductor and driver were busy canvassing more passengers. In the meantime, that TATA bus left for Madurai. There was some commotion about one bus not leaving despite being asked to – some crew were sorting out the issue with the traffic controller. 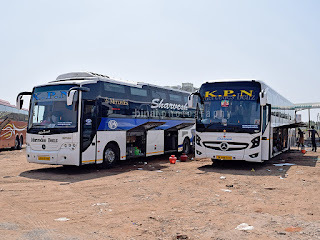 Our crew were busy marketing the bus, and they were shouting out that the bus would stop only at Mandapam and Ramanathapuram – this meant shorter running time to Madurai. The conductor came in and issued tickets a while before departure – the fare was Rs. 98 per head (total Rs. 196). 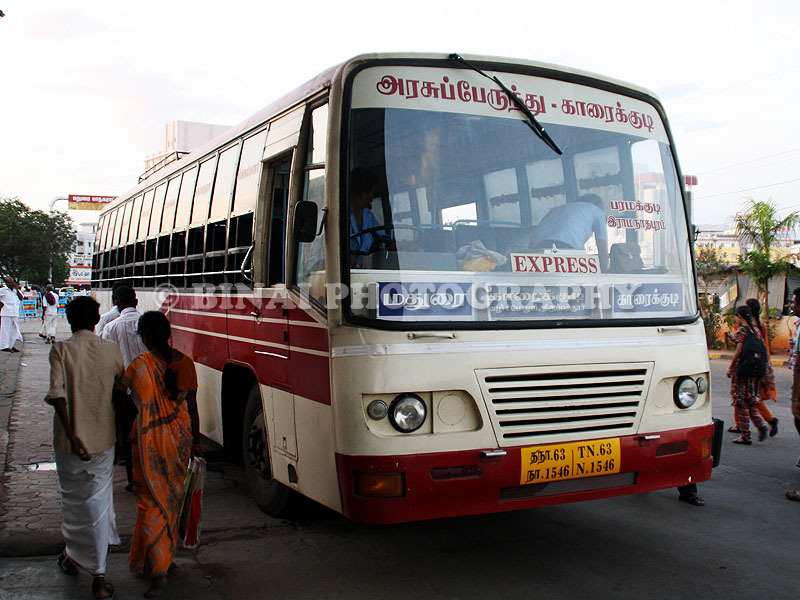 Bus fares in TN have really gone up after the last fare revision. The bus started off at around 1400hrs (note that the timings are only approximate). The driver showed no hurry. The crew were in blue uniform (a symbol of seniority in TN STU parlance) – both the crew were very considerate to passengers. They did not hurry with passengers – did not shout at them to get off the bus quickly nor did they grumble for change. The conductor was very adamant at making passengers sit – he spoke very politely. The bus kept crawling its way towards Mandapam. We reached Mandapam at around 1430hrs – the bus stopped outside the railway station for a minute or so in search of passengers. The bus continued its crawl after we entered the highway – the bus did not exceed 65kmph at any point of time. The driving style was special – the driver shifts to gear 4 very quickly, and then lugs the engine all the time. There was nothing special in the section. We reached Ramanathapuram bus station at around 1510hrs – the driver announced a break, and disappeared into the bus station. 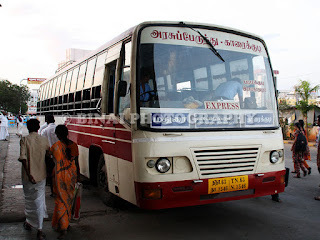 There was another bus to Madurai in the adjoining platform – that was a non-stop bus. According to what the crew mentioned at Rameswaram, our bus should also be going non-stop now – I was full of hopes now. I got off the bus and got some water and some cold drinks. We had stocked biscuits the previous night itself. I got back into the bus soon with the expectation that we’d be starting off soon. The crew re-appeared from nowhere – now the conductor started shouting “Paramakudi, Madurai...” Oh! So we wouldn’t be really going non-stop, but would stop at Paramakudi on the way – no matter, that is just one stop. We left Ramanathapuram at 1530hrs. The bus was back on the highway, and the driver was back to 65kmph. He kept maintaining the pace – it was so boring that I fell asleep sometime on the way. We reached Paramakudi at around 1615hrs – I was expecting to reach Madurai by around 1730hrs – but this progress made me sure that we wouldn’t be reaching before 1800. Paramakudi bus station was all chocked and was a small place. The bus initially went through up to the exit – I heaved a sigh of relief. But wait! The driver had other plans – he backed up and stopped at a platform. The conductor said that we’d leave after a bus standing nearby. We left from there only around 1630hrs. Now the conductor was shouting out “Manamadurai, Madurai...” Oh! Another stop added! The driver continued crawling again. We stopped at some bus station on the way (It was Parthibanur, if I remember correctly). A few other buses overtook us on the way – our driver ensured that neither the road nor the bus had any pain – he kept going at such slow speeds that wear-and-tear would be the least. Atleast two Ramanathapuram-Madurai Non-stop buses overtook us, and few other buses too. We reached Manamadurai at around 1700hrs. The bus was now crowded to the core. Thankfully, the conductor did not add anymore destinations to his list. We left Manamadurai quickly. The railway line kept showing up every now and then. I kept sleeping on and off most of the time. The painful run continued – I’ve never gone in such a slow bus on a highway – the way he lugged the engine pained even more. He picked up some speed after Manamadurai – we did make a couple more stops on the way. Finally we entered the Madurai bypass road and headed straight towards Mattuthavani. We should’ve got off at Viraganoor and taken a bus straight to Periyar (we were staying near Periyar) – but for some reason we continued on to Mattuthavani. I was too sleepy to make any decisions. There was some traffic at the far end of our journey. We finally reached Mattuthavani at 1805hrs – a long 4+ hours to cover 160+ kms. The end-to-end average speed was around 40kmph – that was comparable to my last long distance journey in a 2x3 seater government bus (that was by our own Kerala SRTC Super Fast). The average speed was comparable, but the driving style was too boring. i am going threw your site these days. 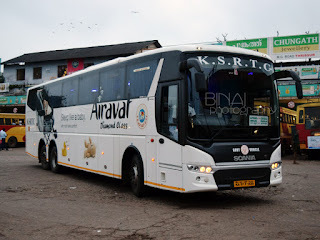 i want to ask your opinion about olivea service--chennai to banglore and whis is the best model available on Indian roads as par comfort level to the passengers ?